An interactive window display. As someone touches the clock on the window, the haunted room comes to life. Room 14A was an installation in a public window display. It was built as our final project for the Pop Up Window Displays class at ITP. 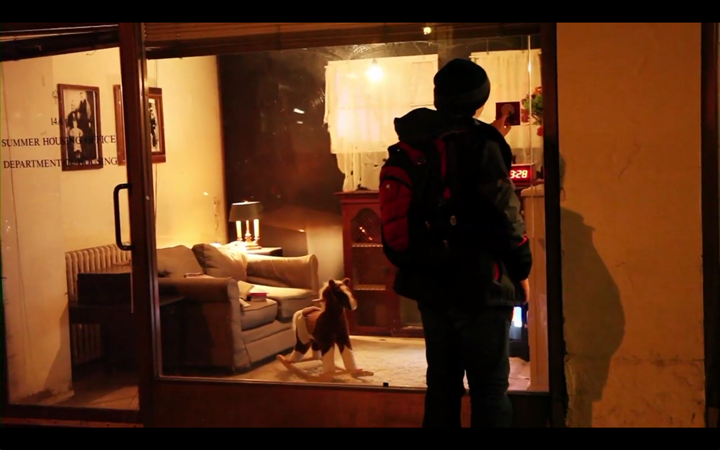 The main concept of the project was to create an old haunted living room, where a mysterious event happened in the past. When a person from the street touches the red button, mechanisms are activated to generate supernatural effects in the scene, thus generating the haunted enviornment. The window installation was on display from 04/13/2014 to 04/15/2014, at 14A Washington Place, New York. The idea and the elements were decided between all team members. Link to a blog post documenting this process, and the refinement of the ideas. 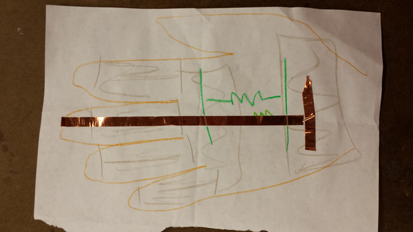 Making the mechanisms hidden to the public was hard. On other physical projects, the location and distribution of the wires and outputs was not that important. It was not the case here; not only we had to find ways of recreating the effect we wanted, but also all these mechanisms had to be hidden from the public, to create the feeling of mystery. A high-energy video game: travel the energy signal of your brain's neurons. Neuron Leap is an interactive exhibit/game highlighting research by Dr. Wendy Suzuki from the NYU Center for Neural Science. Her lab has early findings that link exercise to the strengthening of neural functions that support memory, recall, and learning. In Neuron Leap, visitors experience how our brain cells communicate and how a memory forms by playing this short, fast-paced, high-energy game. Players have to move their hips to progress through the game, and can collect bonuses when jumping at the right time. 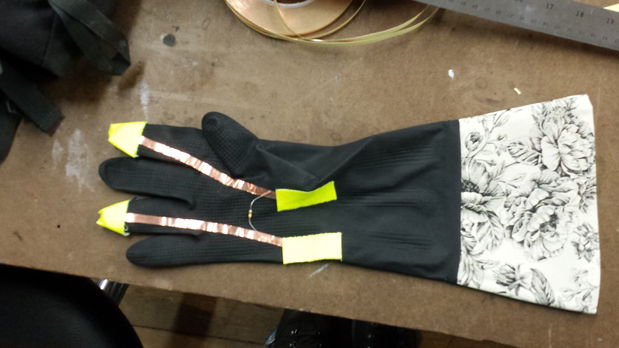 The project was made for a class tought by Hélène Alonso at ITP. World Science Festival 2013. Thank you letter from organizers. A 3D game installation played with your face expressions. 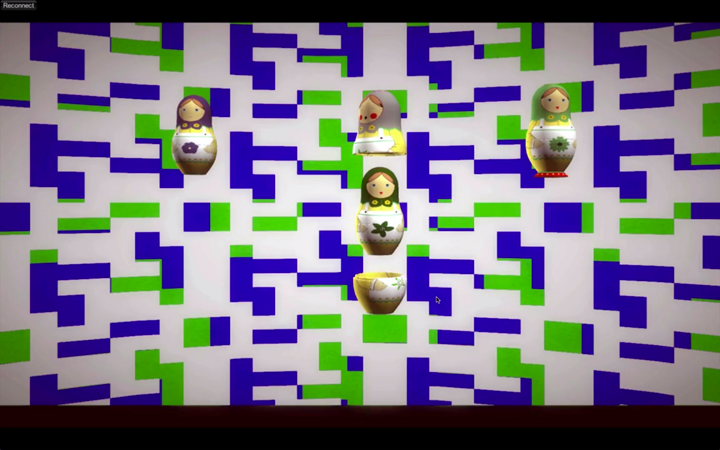 The user controls a matryoshka doll with their face. The doll rotates based on the user's head position. There are 4 different possible states: happy, sad, shy and surprised. The digital space will change based on the current detected expression from the user: the face of the doll, the decoration on its dress, the color of the background and the music. When the user is satisfied with the doll, he presses a button, that doll is finished, and a new doll is revealed inside the previous doll. The user has to finish 4 dolls, and he can choose the desired expression on each doll. The background and the music are additive: each chosen expression contributes to the final background and the final music. This way, the user is also building its own personalized quilt (the background is made like a Russian quilt) made of the combination of the chosen expressions, and same with the music. After the 4 dolls are set, a grand finale occurs. The project was the final for a Unity class at ITP. For face recognition, we used FaceOSC. This tool, when detecting a face from a webcam, constantly sends OSC messages about face parameters: mouth height and width, jaw height, etc. The difficulty came when trying to match these values into a set of 3 expressions: happy, sad and surprised. It was hard to callibrate it so it was accurate for all different shapes of faces. 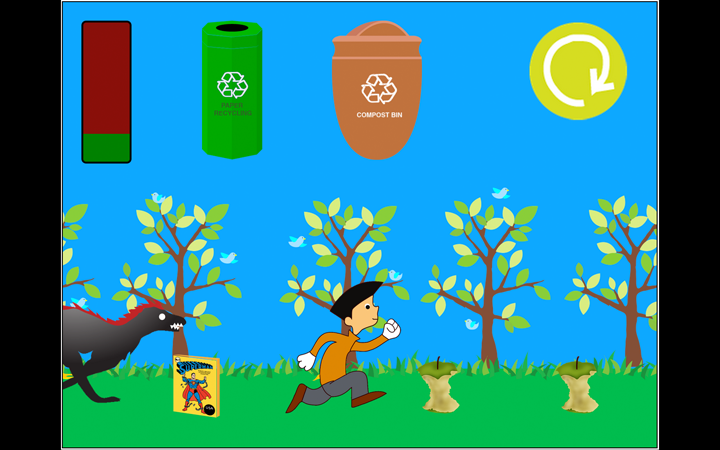 An educational web game for kids about recycling and waste disposal. 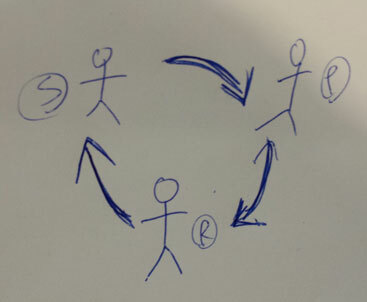 Each player begins by sorting the trash on his/her path into the corresponding trash receptacle. The first level includes a beast chasing the player and the player must keep ahead of the beast by sorting the trash items in his/her path into the appropriate bins at the top of the screen. The intro level introduces two acts of disposal - paper and organic waste. A series of items lay scattered on the player’s path and is presented with images of magazines, corrugated boxes, half eaten apples, banana peels, and so on. Proper disposal of organic waste helps slow the beast with the growth of bushes from the fertilizer derived from compost. The more organic waste is sorted, the higher the chances of survival in the introductory level of the game. Proper recycling of paper waste will build paper wings to fly the player off to the next level, providing a goal or incentive to aspire towards. If the waste is not recycled properly, or not enough waste is collected, the beast catches up with the player and the game is over. 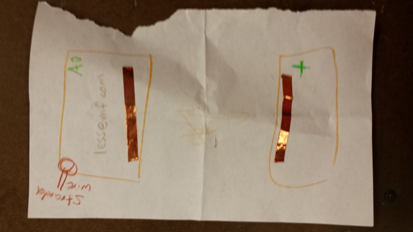 The project was the final for the Designing Simulations and Games for Learning class. Link to a lengthy document explaining the game, the research, the learning mechanics, and much more. Enabling users to have conversations about TV shows - each on their own time. When people watch television they like to talk about what they see on screen, as it happens; they want to share their experience with others. The problem is that these days, people want to watch things on their own time on their DVR or streamed online. Current social tools like Facebook and Twitter only allow for one small comment about a show but not to any specific moment in an episode, and there is the potential for spoilers. This project solves the problem by enabling time-shifted conversations that are linked to specific moments in episodes of TV shows. We designed it to make use of the second screen experience. The project was our final for the Product Poetry class at ITP. 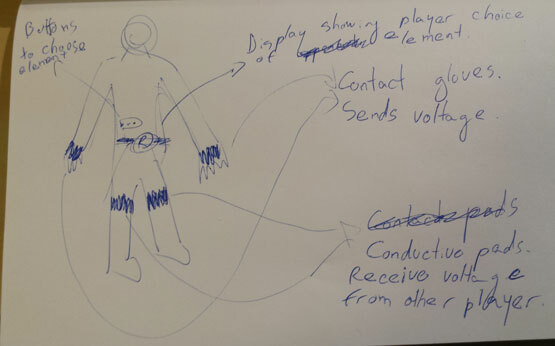 Team member Carl Jamilkowski has a nice blog post that features a slideshow explaining the user interaction and shows some concept sketeches that we made when developing the idea. A fast-paced, technologically enhanced physical game. 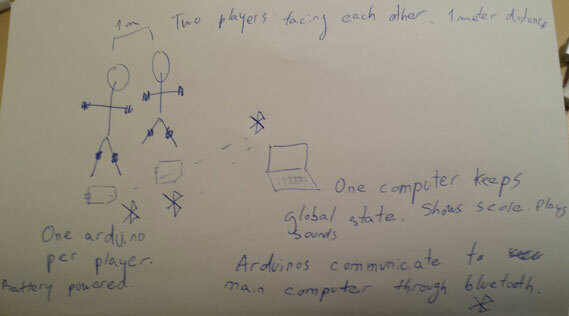 It features a more direct interaction between players than traditional videogames: players have to face each other, move and try to make or avoid physical contact between them. TacTag is my Master Thesis project from ITP. It is a physical game, made possible by technology. 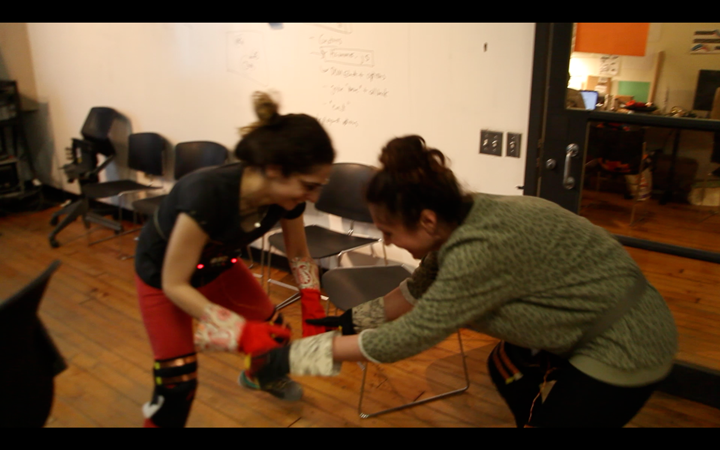 Each player wears two kneepads and gloves, and tries to make or avoid contact with the other based on a rock-paper-scissors mechanic. 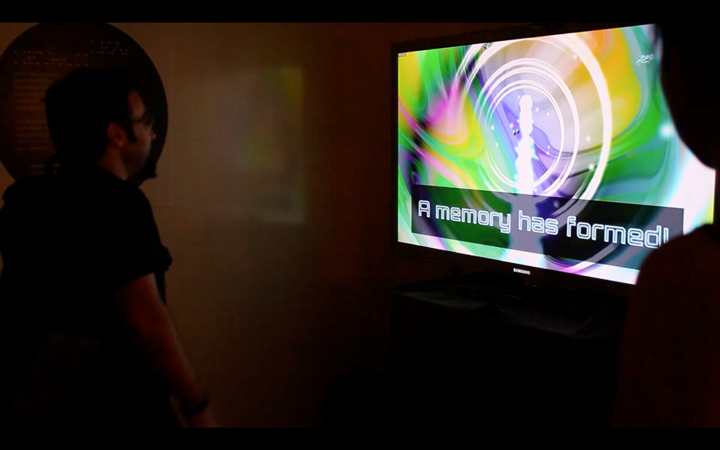 The format is an installation-style game, to be played at exhibitions like Indiecade, or at children's museums. Its main audience is gamers. The goal of the project is to show gamers that a different type of games can be made with technology: games that don't necessarily rely on a screen, but instead involve direct contact between players, and make them move around instead of just pressing keys on a joystick. The scope for thesis is a two player game, but rules and technology where thought to be playable by two teams of 2 or 3 players per team. 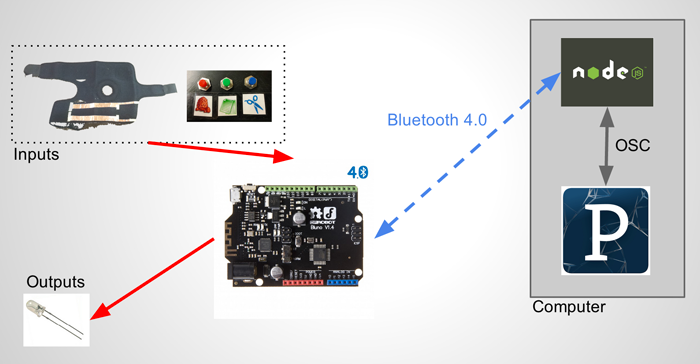 The micro controller used is a Bluno, which is an Arduino with BLE incorporated in it. 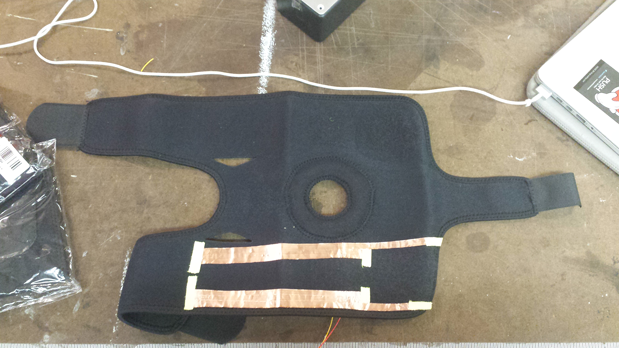 The wired inputs to each Bluno are the two kneepads and the buttons, and the wired outputs are the LEDs. Each Bluno then connects to a central computer through Bluetooth Low Energy. A node.js script is the component in charge of connecting and communicating with all the micro controllers. For doing this, I used a node library called Noble. In turn, this node.js script communicates through OSC protocol to a Processing sketch. This sketch is the piece of software that knows the global state of the game, displays content on the screen, plays sounds and keeps the timing. When I was younger, I used to play a lot of ping-pong with my friends or my brother. Then we got a PlayStation 3 at home, and, with my brother, the ping-pong time was replaced with playing video games on the console. Why did that happen? In my opinion, games that involve more physical activity than pressing buttons while sitting on a couch are healthier. Also, games that encourage a more direct interaction, like players having to look at each other and have physical contact, are better at generating a connection between the people than games where there is a screen between players. Sports are a good example. Nevertheless, there is something alluring in digital games. Is it the flashy graphics and sound? The possibility of being easily immersed in another world, in taking on the role of a character? How technology can enhance the experience of an already functional game is something I want to explore. However, I think that these games sometimes alienate the relationship between the players. Play can be a tool to make people feel closer to each other, and I think traditional video games fail at that; this is something I'd like to address. I'm trying to take the characteristics of what I like about physical games (face-to-face and physical contact) and build an enhanced experience with the addition of technology. I want to create a product that shows gamers that there are different alternatives for playing video games than just the typical screen based ones.